Cape Computer Help has years of experience installing and improving local area networks for homes and office networking systems throughout Cape Cod. Wi-Fi is a specialty and Chris has experience providing Wi-Fi in public spaces also. 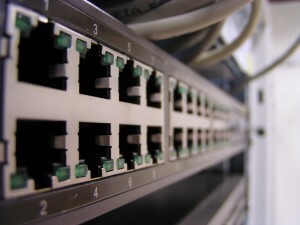 Several major small business computer network upgrades have been performed in recent years including some offices with more than 20 computers. The best way to setup a small business network is to have a central location where the internet service provider (such as Comcast Business) installs their modem. From there a suitable network switch distributes cables throughout the office. A professional installation involves a well labeled patch panel cabled through the wall cavity to wall plates with CAT-6 or CAT-5 sockets. Contact Cape Computer Help for more information, a free consultation and a proposal for the installation or upgrade of your network wiring. A gigabit network switch is then installed to provide service, and if required a Wi-Fi access point can be added. Similar systems are often also installed in homes, especially where the owner requires to be able to stream HDTV from Netflix or Hulu. Although these services do work over modern Wi-Fi installations the bandwidth is only just sufficient, and it will prevent other applications like web-browsing on PCs or Tablets from working correctly. A wired CAT-5 cable is strongly recommended. Chris Dixon was involved in the earliest deployment of wireless networking in some industrial applications before Wi-Fi became commonplace in homes and businesses. This experience allows him to troubleshoot Wi-Fi problems successfully and specify network installations which will work to full performance. Wi-Fi should be configured with a password to protect the rest of the network from hackers breaking in and stealing your data. Any Wi-Fi installation older than 2012 is most likely out of date and should be upgraded to one supporting 802.11n. There are still some cheap Wi-Fi routers that support only the slower networking standards like 802.11b/g. These use the available bandwidth less efficiently and make it more difficult for data to be transmitted. Your Smartphone Service provider will be charging you by the month for the amount of data that you use checking email, surfing the web and streaming video and audio. You should configure your phone to use your Wi-Fi at the office and at home where the data delivery is unlimited, to save your cellular data allocation for when you are out and about. This can save you $20-$30 every month on a family plan where there are several smartphones connected. Contact us today to discuss your home or office networking needs. We will be glad provide the best solution(s) for you.